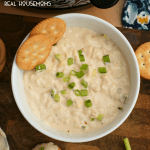 This Cheesy Crock Pot Shrimp Dip that is hot, creamy, and full of tender shrimp will be the hit of your next get-together! Combine all of the ingredients except for the green onions in your crock pot. Cover and cook on low for 1-2 hours, stirring occasionally. Sprinkle with green onions right before serving. Serve hot with toasted bread or crackers. You can spoon this into a dish to serve, but I suggest leaving it in the crock pot on the warm setting and serving it from there.